The last ten years have been very critical and important for the Halaal industry due to the fact that there has been a growing industry and consumer demand for Halaal certification and Halaal certified products in both Muslim and Non-Muslim countries. During this period, the governments of Muslim countries too began focusing on this area and initiated the development and implementation of Halaal standards and policies. I clearly recall the very first Halaal seminar hosted by the government of Pakistan in 2007. Among the guests of honour was SANHA’s Moulana Muhammad Sa’eed Navlakhi Saheb was invited all the way from South Africa to deliver a paper at the seminar. Almost a decade later, not only has Government of Pakistan developed its own Halaal standards, it has also passed legislation to establish requisite of the Shari’ah and right of Muslims to consume Halaal. The Gulf countries too have begun focusing on this area recently which prompted the OIC to establish a formal committee to work on the development of a unified Halaal standard for all its member states and the broader Muslim world. From amongst the Muslim countries, Malaysia is considered to be the forerunner and leader of the Halaal industry. It is the first Muslim Government to establish and introduce Halaal certification at state level and, as a result, they devised an entire system to achieve it. It would not be incorrect to say that the Malaysian Halaal Standard is the foundation of all the Halaal standards developed by other Islamic Governments. Similarly, in 1948, Thailand also passed legislation regarding its own Halaal standard, whereas it is not even a Muslim country. Nevertheless, it is commendable that the Thailand Government realised the need of their Muslim populace and subsequently granted them these legal rights. Since it is Islam that taught us the concept of halaal and haraam, it is a concept which is considered a purely religious act of worship. Therefore, halaal standards in general have been developed based on the principles taught by the Shari’ah and each country has taken its population’s needs as well as the jurisprudence which is generally practiced upon, into consideration when determining their own standards. For some time now, a new discussion is under way regarding the fact that all these different Halaal standards have posed another challenge and that it is becoming an obstacle for businesses and a barrier for trade. What is the way forward? How do we resolve this issue so that there is one common and unanimously accepted Halaal standard for the Muslims across the globe so that the obstacles that have stunted business growth can be removed? Since this question has its roots very deeply embedded in the laws of the Shari’ah and since I have been a member of the Pakistan Standard’s Quality Control Authority Halaal technical Committee for the last five years, I have attempted to shed some light on the subject in these few pages. May Allah make it a means of goodness and blessings, and crown this humble effort with acceptance – Aameen. The foundation of Halaal and Haraam was laid by the Quran and the Sunnah more than 1400 years ago. Eating Halaal and abstaining from Haraam is a command of Allah and it is compulsory for every Muslim, whether male or female, to comply with it by consuming only that which is strictly Halaal and avoiding anything Haraam. There are approximately 7 verses in the Quran Kareem in which Halaal standards have been explained and the Hadith sheds further light on the importance of these principles. Understanding the Quran and the Sunnah, and presenting it in a well-organized and systematic form, is called Islamic Fiqh (Jurisprudence). All the principles of the entire system which we have come to know as Halaal Certification or Accreditation, have already been complied in Islamic Fiqh and explained in light of the Quran and Sunnah centuries ago. Can all the Halaal standards, be merged to form a single common standard? Before discussing a possible answer to this question, let us try to understand the meaning of unity. Unity means gathering at one place and having a common mind-set and thinking. It should also be borne in mind that, for everyone to have the same mind-set or thinking in no way causes anyone to lose his or her identity. Instead, the word is indicative of each one uniting upon preserving and respecting the view and opinion of the other. Nature also demands the very same meaning of unity. Every human being has his or her own distinct features, every village and home has its very own temperament, every government has its own set of laws which would not necessarily be found in the legislation of its neighbouring country. These differences in no way hamper the progress of the world. Instead, one can easily say that it adds to the beauty of life. Therefore, the ISO does not replace the BRC. Rather, both standards assist in ensuring the quality of any given product. Are the custom roles the same everywhere in the world? Are the import policies the same? Are the markets the same? Are the environments the same? Certainly not! Every country has its own legislation and whoever wants to do business with any specific country will have to abide by their legislation and prepare the product accordingly. The same applies to the Halaal standards, which every Muslim country or which the Muslims of any Non-Muslim country have prepared according to their circumstances, varying situation, culture, temperament and, more importantly, their Fiqh. Therefore, having a single Halaal standard for the Muslims of the entire world comes across as something unnatural in my opinion. I have seen the Halaal standards of Malaysia, Thailand, Pakistan, Dubai and the SMIIC. 95% of the content is the same and I am currently writing separate treatise in this regard. None of the Halaal standards promote stunning before slaughtering. In fact, the Pakistan Standard prohibits stunning prior to slaughtering so vehemently that it states: “The meat of stunned animals MAY NOT BE IMPORTED into this country”. As for those countries, which have allowed it, research proves that they have their own internal political constraints compelling them to do so. They are forced to import meat from other countries because they either have no livestock of their own, or they have too little livestock to meet the needs of the populace. Hence, in order to fulfil the needs of their country, they are compelled to allow it. 3.5.2.3 Stunning is not recommended. However, if stunning is to be carried out the conditions specified in Annex A shall be complied. a) All forms of stunning and concussion (loss of consciousness) shall be prohibited. However, when the use of the electric shock becomes necessary and expedient (such as calming down or resisting violence by the animal), the allowed period and the electric current value for stunning shall be in accordance with Annex A of this standard. In general, all forms of stunning and unconsciousness of animals are disliked. 4.5.2 It is not recommended to stun animal prior to slaughtering unless is necessary and in accordance to Islamic law. All forms of stunning and concussion (loss of consciousness) shall be prohibited for both birds and animals. Meat imported from other countries shall also meet this requirement. Pakistan has in no way adversely affected its economy by adopting this strict stance as it is self-sufficient as far as livestock is concerned. 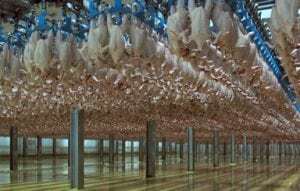 The benefit of adopting this stance will be that, although the avenues of importing stunned meat will be closed, the doors of exporting its own meat will be flung wide open. What is the difference in the standards? All the Halaal standards unanimously agree that stunning is not the ideal course of action. This is a common factor in all the standards. The difference will come about in the conditions stipulated for permitting stunning. Those countries which were compelled to allow it, have done so with very strict conditions. Since Pakistan did not have this problem due to its large source of local livestock, it did not consider this concession. Instead, it opted for the and preferred ruling – that of prohibition. An action (and the ruling accorded to it by the Shari’ah) is one thing and the ruling given to the resultant outcome of that action is something completely separate. One should not slaughter an animal in a direction other than the Qiblah. Since there would be added and unnecessary difficulty caused to the animal in all of the above mentioned situations, Islam has regarded each of the above to be Makrooh (Disliked). However, it should be borne in mind that, if any of the above had to occur during the slaughtering process, the animal will neither be rendered haraam, nor will the halaal status of the meat be affected in the least. If there is a special constraint, the Shari’ah grants concession according to and within the limits of that very constraint. However, there are very strict conditions for this concession. Nevertheless, the outcome of both scenarios is the same. In other words, the animal is slaughtered according to the respective regulations and conditions of Shari’ah which govern it. The animal must also be maintained in an environment that complies with all the conditions stipulated in the Shari’ah (as mentioned above), prior to being slaughtered. This is a very important and basic condition. In both cases, the meat of the slaughtered animal will be Halaal. The only difference is that, in the one case, the animal goes through some discomfort and difficulty and in the other case, there is no such difficulty. Now, if we wish to unite all the Halaal standards on one of these two scenarios, you be the judge as to which one should be stipulated. Should we encourage a self-sufficient country with a population of nearly 200 million people to start stunning their animals, or should we advise the remaining 56 countries to abandon this practice? There is a very simple solution to this issue – honouring and respecting the views of each other. The exporting country should prepare the goods in accordance with the standards of the importing country. In other words, Pakistan should only export that brand of vinegar to Malaysia, which becomes vinegar of its own accord or is completely synthetic and Malaysia should only export those sweets and candies to Pakistan, which are free from E120 colourants. If this simple principle is borne in mind, what obstacle remains? Apart from fish, the Pakistan Standard does not allow the consumption of any other aquatic animal. Thus, let us import only fish from Indonesia and allow us to export all other sea food to Indonesia. If Brazil wishes to export their chicken to Pakistan and the production plant runs a system in which there is stunning or machine slaughter, the way forward is to open a stun free and machine-slaughter free zone and then to enjoy doing good business with Pakistan just like the Pakistani Government ensures that it fulfils the conditions of countries from the European Union when it wants to export to them. If any country wishes to export food colourants to Pakistan, they may export any and every colour except E120 variations. One can see a clearer and far better balance in business through the examples which given above. The same balance cannot be achieved by setting up a single united Halaal standard and allowing each country to import and export whatever it wants. Therefore, my humble opinion is that one should always first endeavour to do that which is possible. There is no sense in neglecting and losing the possible while trying to achieve the impossible.